Beadnell Village is set at the end of a glorious stretch of beach known as Beadnell Bay. The Village is well known as one of the best equipped places in the County for watersports, with the beach lending itself well to surfing, kitesurfing, windsurfing, sailing, scuba diving.... the list goes on. The Village's harbour lies at the North end of the bay and from there the beach, backed by huge dunes of sand, stretches South for miles. The sheer volume of holiday accommodation in Beadnell means that it is one of the most popular destinations for visitors on the coast. The Village itself is split, between the area around the harbour and the Village nearer the main road. 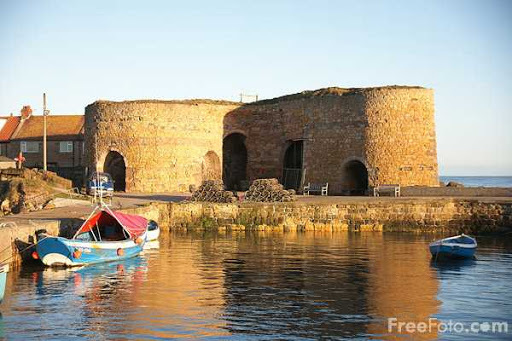 The harbour area is distinctive as it is the only West-facing harbour on the East coast and has beautiful lime kilns that were built in the 18th Century. Buy a Northumberland Guide. Beadnell is a stop on the Arriva "Newcastle - Morpeth - Amble - Alnwick - The Coast - Berwick" which is the service between Newcastle and Berwick on their X18 route (see link below for more information). Multi journey tickets are available and you can get more information here. One of my most exciting childhood memories is coming to Beadnell with school for an activity day that involved raft building, dune sledging and cliff jumping! I will always associate Beadnell with watersports and the stunning, wide, golden sandy beaches make it the perfect location. 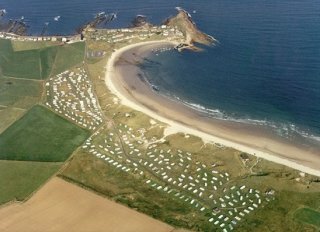 Beadnell has it's own Sailing Club that has been based in the Village for over 40 years. The harbour itself provides an excellent spot to launch boats from and can get very busy in the summer months. The nearby Farne Islands are a popular destination to sail to from Beadnell. Wakeboarding and Waterskiing is another reason to launch your boat from the harbour and the bay provides excellent conditions. Jetskis can also be launched here and are very popular with visitors. Surfing and Bodyboarding are extremely popular when there is a decent swell to ride, the bay can produce swells of up to 15ft in size! The middle and South of the bay are generally the best spots for surfing as the North end is more protected by the Harbour. The wide and long beach is also ideal for windsurfing and kitesurfing either on the sea or sand. Also using the launching facilities in Beadnell are the many diving and snorkelling clubs in the area. With the close proximity of the Farne Islands, there are a large number of popular dive sites close by including the Somali, a ship that was bombed in 1941. Two recommended companies for watersports are Boards and Bikes and Active 4 Seasons. Boards and Bikes are a company that can hire and deliver equipment (Boards, wetsuits, bikes) to your accommodation and also run lessons and courses in various watersports. Active 4 Seasons offer a kayaking and canoeing coaching, guiding and expedition service. Northside Surf School offer beach surf lessons on several beaches along the Northumberland Coast including Beadnell Bay. Courses start at 2 hours and go up to 5 days and are run by Jon Nolan, a British Surfing Association Coach and an RLSS Beach Lifeguard so you know you're in safe hands. They operate 7 days a week and 12 months of the year and cater for all needs. The Good Beach Guide describes Beadnell as "Part of the Heritage Coastline, this is a horseshoe shaped golden sandy beach backed by sand dunes. It is an ideal place for watching the sunset." and is recommended for the highest UK standard of bathing water quality. To find out more about how to launch a boat from Beadnell, visit the Beadnell Boat Launch Website. 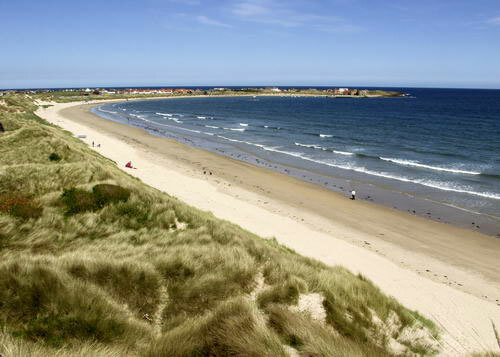 Walkers and ramblers will enjoy visiting Beadnell, it has miles of perfect walking routes along the beautiful coastline. An excellent walk from Beadnell is to head South along the sand dunes towards Low Newton. You will eventually reach this beautiful little Village, the location of the Ship Inn, perfect for a stop off and refreshments before heading back along the coast. The Craster Arms dates back to the 15th Century and the building itself incorporates a three storey stone Pele Tower. Passed down through many generations of the Forster family throughout the centuries, the building was altered in the 18th century and it is believed to have been a public house since 1818. It's located right in the centre of the Village and offers good food and a nice atmosphere, with a large beer garden for the kids to run around in. The Craster Arms is also the venue for their annual music event known as 'Crastonbury' which takes place on the August Bank Holiday weekend. There's live music, entertainment and lots of merriment during this event that starts at 2pm and continues through to midnight. Almost next door to the Craster Arms is the Beadnell Towers Hotel. Both residents and non-residents of the Hotel are welcome to dine here. The food is cooked using the best of local ingredients wherever possible including fresh, locally caught fish, meats and vegetables. The Hotel also regularly host live music and various events throughout the year. The restaurant offers a slightly more 'fine dining' approach to it's food than the Craster Arms. The Village also has a Fish and Chip Shop on Harbour Road that is open most days in the season, but just Fridays in winter. For a a further selection of places to eat and drink, just a couple of miles North is Seahouses, have a look at our guide to Eating and Drinking in Seahouses for more information. The vast majority of housing in Beadnell is holiday accommodation or second homes. As a result of this, in winter Beadnell is almost deserted and there are very few permanent residents. In summer, however, the Village and beach is buzzing with visitors thanks to the large camping and caravan sites, Hotels, B&B's and self catering accommodation. There is a small shop and general store in Beadnell that also acts as the Village Post Office. The nearest supermarkets and food shops are in Seahouses, which is 3 miles to the North where there is a Co-op Food. Alnwick is approximately ten miles away and here you will find a Sainsburys, Morrisons, Iceland, Lidl and Co-op along with numerous independent Butchers, Bakers and other shops selling excellent quality local produce. Also Berwick, to the North, has many supermarkets including Tesco and Asda. The Village Church, the Anglican Church of St Ebba was built around 1750 and is located opposite the Craster Arms. The church is popular with local residents and holds many memorials to local families. It's newest stained glass window showing St Oswald and St Ebba is a memorial to the men from the Village that died during the second world war.